According to the National Center for Education Statistics, the classroom teacher population is more than 75% women — and over 80% white. As school systems examine how best to create classrooms where all students feel represented, engaged, and included, UMBC’s education department is working to address this and other inequalities in education through innovative programs, initiatives, partnerships, and as a platform to amplify critical issues in education. On January 22, the department will host “Teaching and Reaching Black Boys in America: A Conversation,” a panel discussion based on the book The Guide for White Women Who Teach Black Boys. President Freeman Hrabowski will introduce author and educator Eddie Moore, Jr., who will lead an interactive discussion with several contributors to the book, including Jack Hill and Debby Irving, both renowned nationally for their work in race and education. (L-R) Eddie Moore, Jr., Debby Irving, and Jack Hill. Photos provided by authors. It is Allen’s hope that by addressing these topics in the curriculum, evaluation of pre-service teachers, and department programming, education as a whole will also attract Black men who want to become teachers. “In order to fully value and appreciate Black boys and men, teacher candidates need many opportunities to learn from and interact with them as equals before becoming a teacher and assuming a position of power over Black boys,” says Allen. UMBC education graduates are expected to respect diversity, be leaders in their schools, and advocate for democracy and social change. “This includes the ability to address their own beliefs and attitudes that may perpetuate the injustices and inequalities that persist in our society, and have the courage and wisdom to recognize racism and injustice and to become agents of change,” states Linda Oliva, assistant professor of secondary education. Faculty across campus engage in the rigorous development and discussion of culturally responsive pedagogy in all undergraduate and graduate programs. This commitment extends beyond teacher preparation to Professional Development Network Sites in twenty-eight schools across all counties which help engage teachers in dialogue and in planning culturally-responsive classrooms and instruction. UMBC also participates in interdisciplinary collaborations where culturally responsive pedagogy is applied through partnerships like Lakeland Elementary and Middle School with the Sherman STEM Teachers Scholars Program and the new Center for Early Learning in Urban Communities with Baltimore City Public Schools; the STEM partnership with Howard County Public Schools, the STEAM partnership with Digital Harbor Foundation and programs like Hour of Code, the Path Before Me, and the development of the Valuable Voices App that helps teachers create linguistically inclusive classrooms. UMBC students celebrate 10 years of the Sherman STEM Teacher Scholar Program. Photo courtesy of the Sherman STEM Teacher Scholar Program. Christine Mallinson, professor of language literacy and culture (LLC) and co-creator of the Valuable Voices app has worked with other linguists and educators since 2009 to provide workshops and trainings to hundreds of K-12 teachers across the United States. Through her outreach, she has found it especially important for white female teachers to understand how they communicate with students, especially Black male students, in order to establish strong relationships and create a welcoming environment across gender and racial boundaries. Events where participants can reflect, plan, and implement the ideas shared during the panel are already scheduled and will continue throughout the year. The first follow-up will be held at the BCPS Learning Center with faculty from the Arbutus Learning Center to further discuss and plan with teachers and members of the BCPS Office of Equity and Cultural Proficiency, which promotes support for equity and fairness for students and teachers in all academic programs. 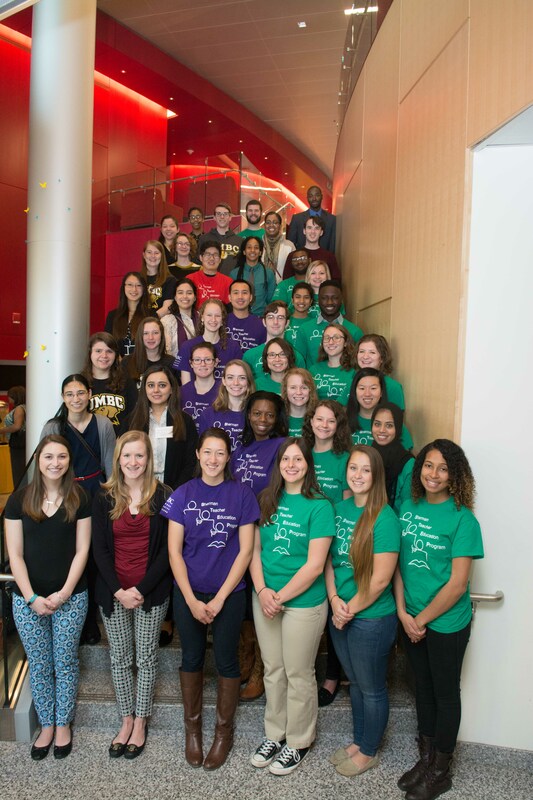 The second will be led by the UMBC education department’s diversity committee, with teacher candidates, administration, faculty, staff, and members of partnerships schools. The UMBC teaching master’s degree program is accepting applications for summer and fall. Educators interested in creating culturally inclusive classrooms in Maryland can attend the Maryland Education Recruitment Consortium’s 10th annual Teach Maryland Fair on Saturday, March 24, 2018, at UMBC. Banner image: UMBC students volunteer at Lakeland. Photo by Marlayna Demond ’11 for UMBC.